These are two very useful cooking techniques that can be used to prepare all kinds of food. From barbecues to cheese on toast you'll use the grill quite a lot when you're a student. Once again you don't really need any expensive equipment to cook with the grill or griddle, although obviously you will need a griddle pan if you want to try out this particular cooking technique. A decent pan doesn't come cheap but it is so versatile and can be used to cook so many different foods, that you might decide it's worth the investment. You could try and persuade your housemates to chip in, as they'll be enjoying the benefits of the pan, as well! The grill is a well-used part of the oven and with good reason. It can make a very decent substitute for a toaster and is invaluable for that student staple; cheese on toast. It's also a pretty healthy way to cook. For example, if you want a healthy fry-up, grill your sausages, bacon and mushrooms instead of frying them. All kinds of meat and fish can also be grilled and it's a quick and easy cooking method that doesn't take a lot of practise to master. Make sure the grill is properly preheated before you place the food under it. Check any instructions on the packaging to make sure you cook food for the correct time. Use kitchen foil on the grill pan to stop liquid or crumbs dropping into the pan - this saves on washing up! lIf you're making cheese on toast, grill the bread on one side first, then top the other side with cheese and grill it - that way, both sides are cooked through. Always check meat is thoroughly cooked through before eating. 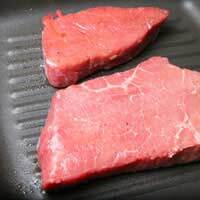 If you're not familiar with a griddle pan, you might well have noticed the lovely criss-cross pattern on a chicken breast or steak when you've eaten in a restaurant. This is the result of griddling and it's basically the equivalent to an indoor barbecue, in that the food has a slightly smoky, charred taste. Griddle pans are generally square in shape, very heavy and they have raised ridges running along them, which come into contact with the food and conduct the heat from the base of the pan. Griddling is another healthy way to cook, as you don't need to use much oil. Plus, any fat or oil from the food gathers between the ridges and won't get transferred to your plate. Make sure the griddle pan is nice and hot before placing the food on it. Brush oil directly onto the food, rather than on the pan. Don't move the food around too much, if you want those nice lines. Turn chicken or steaks at a right angle, halfway through cooking on each side, to get the criss-cross effect. Wipe the griddle pan clean with a sheet of kitchen towel, after use. Get to grips with the grill and the griddle pan and you'll have two deliciously healthy ways to cook meat, fish and vegetables.